The UC San Diego Tritons men's basketball program represents the University of California San Diego at the National Collegiate Athletic Association's Division II level. 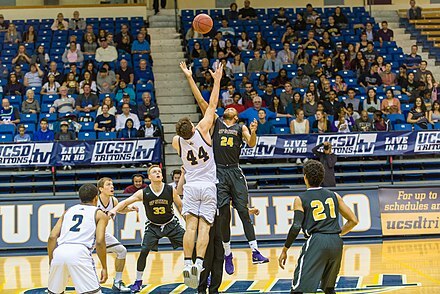 UC San Diego basketball plays its home games at RIMAC Arena in La Jolla. At the end of the 2007–08 season, they won the CCAA Tournament and advanced to the first round of the NCAA West Regionals. After a relatively dry spell, the team has seen most of its success in recent years under Eric Olen. In 2015–16, they were the NCAA West Region runners-up. The 2016–17 season was the first in which they won the CCAA regular-season title; they also won the CCAA Tournament and were again NCAA West Region runners-up. The team won the CCAA Tournament again in 2017–18, but dropped in the NCAA West Regional quarterfinals. The Tritons have the most CCAA Tournament titles of any current CCAA member school, with three. Triton basketball will transition to NCAA Division I and the Big West Conference in 2020. They will not be eligible to participate in March Madness until the reclassification period ends in 2024. ^ "Basketball Record Book – UCSDTritons.com—Official Web Site of UC San Diego Athletics" (PDF). UCSDTritons.com. Retrieved March 10, 2018. ^ Leonard, Tod (March 13, 2017). "UCSD falls to Chico St. in West Regional finals". San Diego Union-Tribune. Retrieved June 12, 2017. ^ Schneider, Gabe (November 27, 2017). "UC San Diego to Move to Division I Sports". The Triton. Retrieved January 31, 2018. ^ "Men's Basketball Postseason History" (PDF). UCSDTritons.com. University of California San Diego. Retrieved March 17, 2018. This page was last edited on 19 May 2018, at 03:05 (UTC).